Please contact owner Steve Email: skoepenick@aol.com - Phone: 805-340-5985. Unique opportunity to own one of the last MacGregor trailerable sailboats off the line before MacGregor closed in Costa Mesa, CA in 2012. This boat is like new. We purchased it new and a month after we got it my wife was in an auto accident and was unable to sail. 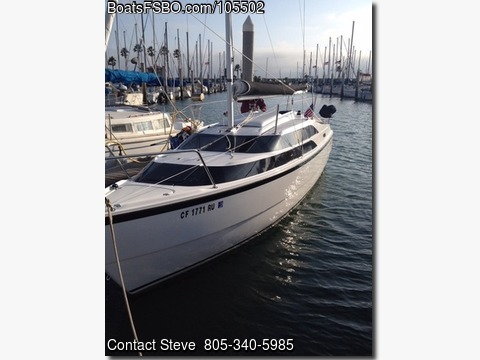 Very few of these boats are available This is a well equipped, spacious family sail boat in excellent condition. This is a combination of a sailing boat and a motor boat. The hull design incorporates a shallow draft V bottom and the keel provides good windward performance under sails. Very low hours on the 60 HP Evinrude engine. The boat has been in dry storage. The MacGregor Power Sailer features 22 MPH UNDER POWER GREAT SAILING PERFORMANCE LOWEST COST FULL STANDING HEADROOM WHEEL STEERING ENCLOSED HEAD SLEEPS 6 FULL GALLEY WALK THRU TRANSOM BUILT IN SAFETY FLOTATION UNDER 8' WIDE FOR LEGAL TRAILERING ALUMINUM TRAILER ROTATING MAST SYSTEM LAUNCH AND RIG IN 10 MINUTES WATER BALLAST SYSTEM. This boat features White hull with black stripes Deluxe Model Trailer with stainless steel disc brakes and fiberglass fenders Genoa jib, 208 sq ft including adjustable blocks and sheets Roller furling system for Genoa Roller furling mainsail includes topping lift and halyard led aft - just roll up the mainsail and go - it covers itself and reels as small as you like Boom Vang for better mainsail shape Mast raising system. Steering linkage kit Large capacity marine head 5.2 gallon tank with deck mounted pumpout Cockpit seat cushions Boarding and swim ladder Evinrude 60HP E-Tec with tach, wiring harness, power cables, recessed shifter prop and 6 gallon tank One 12 gallon gas tank strapped down with one 6 gallon Built-in countertop stainless steel alcohol stove Dual battery system with 4-way switch Deluxe AM/FM, Ipod, Satellite Ready Stereo System, Shore power 120V with battery charger and GFI receptacle 12 V outlet, plug near galley for cell phones, etc. Length overall 25' 10" Waterline length 23' 2" Width Beam 7' 9" Draft, board up 12" Draft, board down 5'9" Engine 60 HP Speed, 60 hp outboard 22 MPH Water ballast 1150 lbs Permanent ballast 300 lbs Total ballast 1450 lbs Boat weight, empty 2550 lbs can be towed behind car Standard trailer weight 530 lbs Sail areas Main 170 sqft Genoa 150 Fresh water capacity 5 gallons Mast height above deck 30' Mast height above water 35' Cabin headroom 6' Head, Berths sleeps 6, 2 doubles, 2 singles. CALL OR E-MAIL FOR A 16 Page Brochure in PDF file.